Charles Green, aka Angry Grandpa, in a screenshot from the infamous bomb prank. Angry Grandpa was the alias of the late Charles Green, a YouTube celebrity who made videos of himself and his grown child, Michael, along with his girlfriend, Bridgette. Despite being a very popular YouTuber, he has had many videos deleted over the years, which have no mirror upload whatsoever. One of the most notable deleted videos is "the bomb prank", a presumably early prank from around 2011. It was removed for legal reasons and because of negative backlash. Only 2 screenshots have surfaced, one of the thumbnails, the other provided by Lost Media Wiki forums user summertime. According to them, "the video was about grandpa receiving a package in the mail. He opened the box to find a bomb inside, and Michael pretends to contact police on his cell phone (secretly contacting a friend of his who was in on the prank). From there, they are given instructions on how to deactivate the bomb. Michael tells Grandpa to cut one of the wires, so he gets a pair of scissors and cuts the wire as told. Michael immediately yells saying he cut the wrong wire and that the bomb would explode. Grandpa grabs the bomb and throws it out the window, before running to another room in his house with Michael." Another famous missing video was the sequel to "the heart attack prank", a presumably revised version of the original. It was also removed due to negative reception from fans (of which Charles cared about quite a bit). Yet another video was of Michael singing The Andy Griffith Show theme song very shrilly. This video was made shortly after Andy Griffith's death, and it was likely removed out of respect. 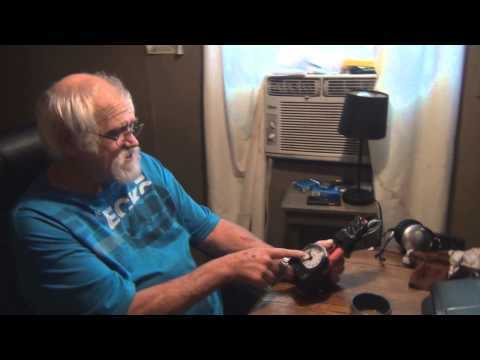 On December 17, 2017, one week following Angry Grandpa's death, KidBehindTheCamera created a video discussing the future of the channel where a clip of the bomb prank is shown. KidBehindTheCamera also plans to fully reupload the Fake Bomb Prank and other deleted videos in the future. ↑ Removed Videos page from the Angry Grandpa Wiki. Retrieved 04 Jun '14. ↑ summertime's thread. Retrieved 12 February 12.